Rev. Naim Ateek has been the subject of a smear campaign by B’nai Brith Canada. Carrying a message of non-violent resistance to the Israeli occupation, Palestinian liberation theologian Rev. Naim Ateek arrives in Ontario today from the Maritimes. His tour to promote his latest book, A Palestinian Theology of Liberation: The Bible, Justice, and the Palestine–Israel Conflict, began in B.C. and concludes with a theology of liberation course at the University of Toronto (May 2-3). Once again, as it has done on so many other occasions, B’nai Brith has tried to spread unfounded allegations of antisemitism to silence a Palestinian voice. It has failed – all planned events have gone forward successfully. But B’nai Brith’s action may be an opportunity to encourage more serious discussion of the issues that Ateek raises. Rev. Ateek quotes this passage verbatim on page 57 of his book, attributing it to Brownfeld. This citation, which Ateek used on a slide, is what B’nai Brith manipulates into its baseless antisemitism smear. Sid Shniad – a member of the Steering Committee of Independent Jewish Voices Canada (IJV) who attended Ateek’s lecture in Abbotsford, British Columbia – explains: “The B’nai Brith statement is total BS. Ateek cited passages like this one from Brownfeld, followed by other passages from the Talmud and other sources contradicting such passages, showing that there is no basis for Israel or Zionists to claim Biblical or other religious foundations for creating a Jewish state or discriminating against non-Jews.” Ateek is a steadfast ally to Jewish liberation theologians. Indeed, his event in Hamilton (April 3) is hosted by the Jewish Liberation Theology Institute, building on Ateek’s decades of ecumenical and interfaith work. Moreover, they have edited out of the paragraph they have seized upon in Ateek’s book the racism of Rabbi Moshe Levinger, who likens dead Palestinians to dead flies. According to Jewish Canadian journalist Gerald Caplan, a former national secretary of the New Democratic Party (NDP), B’nai Brith Canada supported Levinger’s legacy. None of this can be understood outside of context. CFOS and IJV stand united in the quest for justice and peace in Israel–Palestine and condemn B’nai Brith’s attempts to silence and defame Rev. 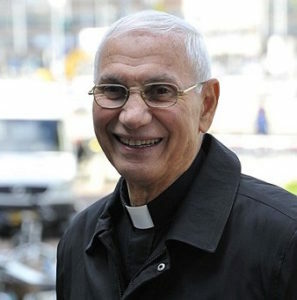 Ateek, a principled advocate for a just future for all in the Holy Land. Canadian Friends of Sabeel (CFOS) is a grassroots organization working for justice, peace, and reconciliation in the Holy Land. CFOS emerged in response to the call from Palestinian Christians to bear witness to the ongoing injustice against the Palestinian people. We do this primarily through education and solidarity projects in Canada. For more information, contact info@friendsofsabeel.caor info@ijvcanada.org.